In my “celtic tigress” days I would have thought nothing of roasting a chicken, picking what meat I liked and then throwing away the carcass. It’s far from throwing away the carcass I was reared and my mother still makes her own stock from roast chicken which I now do as well. If I’m careful 1 medium chicken will do us for 3 meals and if I have potatoes left over from dinner it also makes a batch of my potato scones. After eating our roast chicken dinner I pick over the carcass for any bits of chicken that I’ve missed and put them to one side. I then heat the oven to 200 degrees Celcius and roast the bones for 30 minutes. You might think that I’ve gone a bit crazy to be roasting the carcass of a chicken that’s already cooked but it gives your homemade stock a lovely nutty taste. I then put the carcass into a large pot and cover it with water (nothing else) and simmer for 90 minutes. Strain the bones and any fat which has risen to the top away when cool and you have a wonderful base stock for any dish you like. I use my stock for soup, risotto, broths and gravy. You can freeze the stock once it is cool in a freezer bag and it will keep well for up to 1 month in the deep freeze. This jar salad uses up the bits and pieces of chicken that you can’t carve. Personally I think they’re nicer than a plain chicken breast, moister and more flavourful. The beauty of the salad is that it’s prepared in 1 bowl then placed in a jar or a pot, all the ingredients are cold and it transports perfectly to work, college or school for your lunchbox or picnic. Place the dried rice noodles and frozen peas into your large bowl and pour the warm water over them. Put to one side for 5 mins. Peel your carrot (if you haven’t already). Using the potato peeler, peel the raw carrot into thin ribbon pieces. Chop the pepper into thin strips. Chop the chicken into bitesized pieces (if they are too big). Strain the water from the noodles and return the noodles and peas to the bowl. Add the chopped pepper, ribbon carrot and chopped chicken to the noodles. In a cup place the lemon juice, rice wine vinegar, soy sauce and sesame seeds. Use a fork to mix them well together then pour over the vegetables and noodles. Stir well to mix in the dressing. 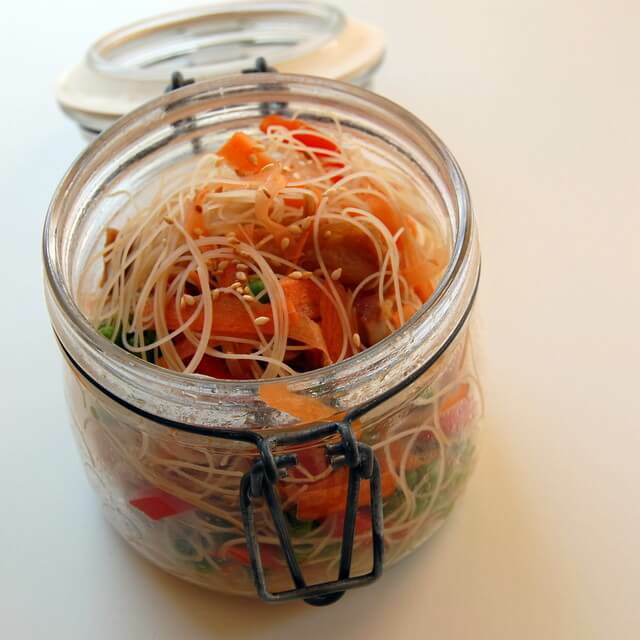 Transfer the salad to a jar or container and it will keep in the fridge for up to 24 hours. If you would like to keep your salad cold when transporting instead of defrosting the peas at the start of the method add frozen peas to your jar just after you remove it from the fridge. By the time you eat it they will have defrosted but in the meantime they will keep your salad chilled. what a brilliant blog post! It never occurred to me to roast the bones before making stock (and am actually quite lazy about ever making stock really) but I definitely will now – and LOVE the idea of the jar salad! I keep trying to prepare my own stock, but as there are only two of us, not too often we have a whole chicken. So either I don’t have a chicken for stock, when I need it, or I don’t need stock. I will master it one time. Hey there! Just a question, I’ve made stock before, but the whole pot seems to turn to jelly like substance. Is that normal??? Hi there Amy. Jelly like substance is a sign of a brilliant stock! It will liquify if you heat it back up again. Well done! How long do you roast the chicken carcass ? Thanks for pointing out the error. I roast the carcass for 30 minutes at 200 degrees Celcius before making the stock. I’ll amend the post above now!